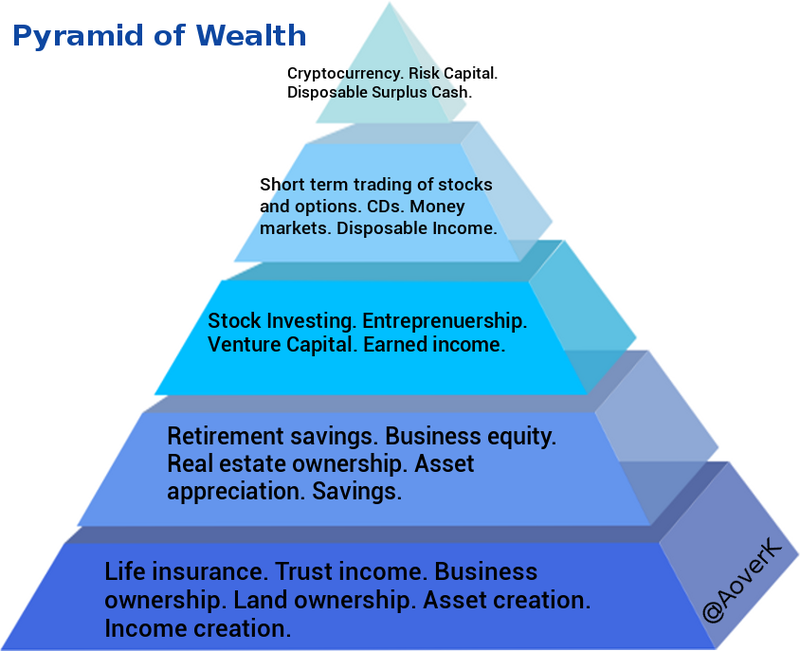 The Pyramid of Wealth is a concept I developed while considering the creation, growing and maintaining of wealth. Wealth that lasts beyond your own life and helps future generations build for themselves. Some stocks have increased 200% in a day this year. So, I get that it may be hard to distinguish between the investing and gambling. However, the boundaries still exist. The Pyramid of Wealth was created to be a quick and easy reminder of those boundaries. Boundaries that should be clearly defined both in our minds and objectively so we don’t confuse one with the other. By reminding ourselves that there are boundaries between asset classes in our mind, it becomes easier to create spending, saving and investing habits that help reinforce positive investing habits. The best thing about seeing a picture of how wealth is divided, is that it makes it easier to see how one can move between the different levels. Regardless of where you are today, you can see what the next step is that will take you a different level. One thing that is underestimated today, is the opportunities that we all have right where we are. Whether that opportunity comes from what you know, what you’ve experienced in life, the people you know or where you are located. We all have our advantages in life and our own story to tell. What are yours? What vital few steps can you perform to move you closer to your goal? A lot of progress can come from focusing on the important and moving in a single direction while ignoring the small things in life. Pick a destination. Pick an action. Then get moving. Disclaimer: This article is for informational purposes only. None of the information provide here should be interpreted as a recommendation to buy or sell securities or as specific investment advice. All opinions and ideas expressed here are the authors own and do not represent any other parties.